To Cite: Fiala A, Kroess R, Neururer S, Braun P, Nachbar N, et al. Effects of Head Extension on Peak Airway Pressure During Mask-Ventilation: A Prospective, Randomized, Clinical Single-Centre Trial, Ann Anesth Crit Care . 2017 ; 2(1):e11435. doi: 10.5812/aacc.11435. Background: Rescuers with basic skills may have difficulties to perform efficient and safe mask ventilation. This study aimed at determining the best head position for ventilation, while avoiding stomach inflation. Methods: Forty healthy patients were mechanically ventilated with a face mask (7 mL.kg-1). The head was positioned either with n = 20 or without a cushion support (n = 20), and in three different head extension positions. Results: Head angles differed more with no cushion support at 12°; 95% CI 6 - 18°), 25° (95% CI 17 - 33°) and 32° (95% CI 27 - 37°); P < 0.05) when compared with cushion support at 5° (95% CI 3 - 7°), 16° (95% CI 13 - 20°), and 22° (95% CI 18 - 26°); P < 0.05. Without cushion support, peak airway pressure in neutral position was higher (20 cmH2O, 95% CI 17 to 23 cmH2O) than in the anesthesiologist’s favorite position (16 cmH2O, 95% CI 13 to 19 cmH2O; P = 0.000) or in extension (16 ± 7 cmH2O, 95% CI 13 to 19 cmH2O; P = 0.000). Stomach inflation correlated with body mass index in the neutral position, and in the anesthesiologist’s preferred position without cushion support. Conclusions: Our data suggested that maximal head extension with no cushion support yields the lowest and thus safest peak airway pressure during mask ventilation. Mask ventilation during a medical emergency could improve survival (1). Previous studies showed that rescuers with basic airway skills could fail to adequately mask ventilate (2). One of the main challenges during bag-valve mask ventilation is to sufficiently open the upper airway, keep it patent, and seal the face mask (3). An obstructed airway may result in ventilation failure, while partial airway obstruction may result in increased pressure, stomach inflation, and subsequent adverse events, such as regurgitation, stomach distension, diminishing pulmonary compliance, aspiration, pneumonia, and reduced survival (4). Gentle bag-valve mask ventilation was deemed to be an advantage (5). Thus, when keeping peak airway pressure low during bag-valve mask ventilation, the risk for stomach inflation is minimized. 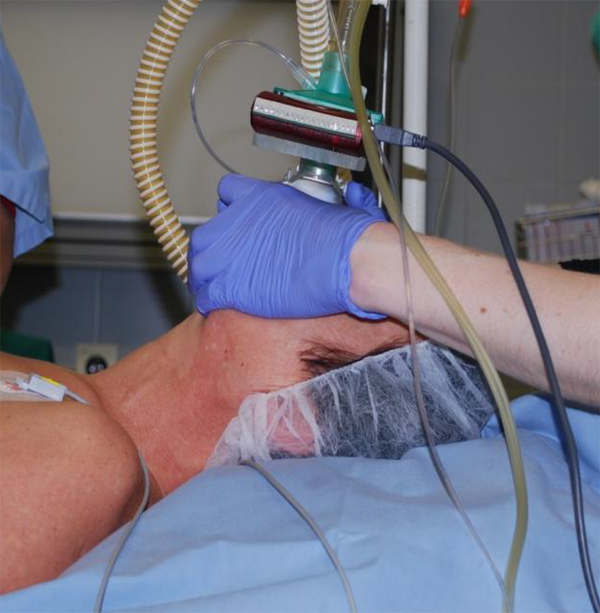 Routine clinical practice in the operating theatre and a previous study suggests that bag-valve mask ventilation could be improved when the head is positioned on a support (6). Furthermore, Kobayashi et al. showed that during propofol anesthesia a head elevation of six centimeters decreased upper airway collapsibility (7). This study therefore sought to determine which head positions during bag-valve mask ventilation would yield the lowest peak airway pressure and would therefore be best for optimizing oxygenation, ventilation, and for avoiding stomach inflation. The hypothesis was that when bag-valve mask ventilating a patient, a cushion support below the head might result in lower peak airway pressure and subsequent stomach inflation than when the head is positioned on a flat surface such as the operating room table. The study protocol was approved by the local ethics committee of the medical university of Innsbruck, Austria. The trial was registered as ClinicalTrials.gov NCT01909310 (July 24th, 2013). Enrollment, allocation, and analysis followed the CONSORT guidelines, 2010. Forty patients (ASA I, n = 28 and ASA II, n = 12), who were scheduled for planned minor surgery during general anesthesia, were enrolled after obtaining written informed consent. Exclusion criteria included a non-fasted patient, body mass index > 35 kg.m2, cervical spine pathology, or neurological deficiencies due to cervical spine pathologies, malformations of the upper airway or head, hiatus hernia, or gastro-esophageal reflux, past medical history of esophageal or gastric surgery, acute respiratory infection, or obstructive airway disease. Standard monitoring (ECG, non-invasive blood pressure measurement, pulse-oximetry, end-tidal CO2, and a peripheral IV cannula) was established. After pre-oxygenation, total intravenous anesthesia (propofol 2 to 3 mg.kg-1, remifentanil 1 to 2 µg.kg-1) and neuromuscular blockade (rocuronium 0.4 to 0.6 mg.kg-1) were induced. Complete neuromuscular block was verified by a train of four (TOF) measurements of zero percent. A face mask was applied with a double C-clamp by the anesthesiologist and in order to standardize ventilation, patients were mechanically ventilated (Primus, Draeger, Lubeck, Germany) with volume control (7 mL.kg-1, tailored to ideal body weight). No additional oral airway or physical maneuvers to open the mouth were used. Positive end-expiratory pressure (PEEP) was set to 0 cmH2O (corresponding to mask ventilation in an emergency); 10 ventilations per minute were set according to the 2010 European resuscitation council guidelines (8). Randomization was performed either to head position without (n = 20) or with a cushion support (n = 20; head form 1/B, 122-1PU-med, Eurofoam, Vienna, Austria) with a height of 6 cm. During ventilation, the head of every patient was tilted in 3 different head positions, i.e. i) in neutral position, ii) a position deemed ideal by the anesthesiologist, and iii) in maximal extension; the sequence of these three head positions was randomized with www.randomizer.org. Ventilation and circulatory parameters were recorded by a standard monitor (Datex AS/3 Anesthesia Monitor, GE Healthcare, Vienna, Austria), and transferred to a laptop (Dell, Inspiron 8200, Frankfurt/Main, Germany; with data collection software S/5 Collect 4.0, Datex-Ohmeda, WI, USA). Head angles were recorded by a prototype electronic level described earlier (6) (Figure 1). A stethoscope was positioned on the epigastrium (9) to detect stomach inflation. Presence of gastric sounds was assessed by blinded anesthesiology nurses. Inter-rater reliability was not assessed. Data were collected for 1 minute in every head position during confirmed complete neuromuscular blockade. All statistical analyses were performed using SPSS 21 (international business machines corporation, Armonk, NY). Continuous data were given as mean and as 95% confidence interval, and categorical data were presented as percentages. The Mann-Whitney U test was used for group-wise comparisons. Furthermore, analysis of variance (ANOVA) was performed for analyzing impact of cushion support on ventilation parameters. All statistical tests were two-sided. P values of < 0.05 were considered statistically significant. The Spearman-Rho test was used for correlations. Initially, sample size estimation, according to a power of 80%, a type I error of 5%, regarding differences in peak airway pressure suggested the need for 70 patients (80 to cover possible drop-outs). A pre-planned half-way interim analysis revealed that 800 patients (400 in each group) would have been needed to show a difference in peak airway pressure (P < 0.05) between results in presence and absence of cushion support. Initial vital signs and patient characteristics were evenly distributed; vital signs did not differ during analysis (Appendix 1). Head angles in the three positions differed more in the absence than in the presence of a cushion (Table 1). Regardless of the absence or presence of a cushion, no difference was seen in peak airway pressure, mean airway pressure, dynamic lung compliance, and tidal volume or end-tidal CO2, as long as the patient’s head was in the same head extension position (Tables 1 and 2). Variance analysis also showed no significant influence of a cushion support on ventilation parameters (peak airway pressure P = 0.798, mean airway pressure P = 0.750, dynamic lung compliance P = 0.525, tidal volume P = 0.946, and end-tidal CO2 P = 0.846). Stomach inflation occurred in 25% to 35% of patients, irrespective of the head position. Body mass index and stomach inflation without cushion support correlated in neutral (correlation coefficient 0.445) and anesthesiologist’s preferred (correlation coefficient 0.511) position (P = 0.049 and P = 0.021), yet not in maximal head extension (correlation coefficient 0.2 and P = 0.397). Within the group without cushion, peak airway pressure in the neutral position was higher than in the anesthesiologist’s position or maximal extension (P = 0.000; Table 2). Similarly, mean airway pressure in the neutral position was significantly higher than in the anesthesiologist’s position and maximal extension (Table 2). Furthermore, dynamic lung compliance was lowest in the neutral position (Table 1). Amongst the group with cushion, head angles differed to a lesser extent between the different head extension positions and ventilation parameters were comparable between these three positions (Tables 1 and 2). Contrary to the hypothesis, it was found that no significant difference in peak airway pressure, mean airway pressure, dynamic lung compliance, tidal volume and end-tidal CO2, was found between the two groups’ head in the presence and absence of cushion support. By trend (but not significantly), peak airway pressure was lower in the group without cushion support and with maximal head extension. Studying the optimal head position for opening the upper airway in a cardiac arrest patient is impossible for ethical reasons. Therefore, the approach for the analysis of upper airway patency in anaesthetized patients may be a valid alternative. Since several studies (10, 11) showed that rescuers have difficulty opening, keeping open the upper airway, and sealing the mask, bag-valve mask ventilation is usually less optimal than it could be. Thus, an optimized head position during bag-valve mask ventilation may improve ventilation in an unprotected airway. The oral, pharyngeal, and tracheal axes form a better alignment when the head is positioned on a support (12). In fact, in the operating theatre, positioning of the head on a cushion support is commonly done to improve mask ventilation (6). Current European resuscitation council guidelines recommend head tilt, chin lift and jaw thrust, as well as a two-hand technique for bag-valve mask ventilation to improve the patency of an obstructed airway (13, 14). Interestingly, a support cushion is not mentioned. Previous studies investigating the influence of various head extension angles on bag-valve ventilation found that the maximum extension of the head in adults was 42°, which was suggested to facilitate ventilation of an unprotected upper airway (15). In pre-school (-1° or 13°) and school children (16°), it was beneficial to extend the head to a lesser extent than in adults to optimize mask-ventilation (16), which may be explained by the reduced cervical spine movement in children (17). An MRT study in spontaneously breathing neonates showed a high probability of a patent upper airway with a head tilt angle of 144 to 150° (angle between occipital-opisthion line and ophisthion-C7 spinous process line) (18). Studies in adults during midazolam sedation (19) or propofol anaesthesia (with muscle relaxation) (20) showed that head extension decreased upper airway collapsibility and closing pressures, respectively. A previous study suggested that employing a cushion support improves bag-valve mask ventilation, yet different PEEP levels between groups prevented a robust conclusion (6). In contrast to previous studies, tidal volumes were compared when the head was positioned on a cushion and without a cushion (6). In our patients the lowest, although not significant, mean peak airway pressure was observed in the group with no cushion support when the head was maximally extended. This correlates well with the findings of Walsh et al., who reported a decreased critical closing pressure when the head was flexed and extended in patients with propofol sedation (21). Although the study could not deliver a final proof, in accordance with findings of other studies, it may be prudent to position the head without a cushion in maximal extension during ventilation of an unprotected airway in a non-trauma patient where there is no risk of cervical spine injury. However, even during induction of anesthesia for scheduled surgery, incidence of stomach inflation was ~30%, irrespective of head position. This unexpected observation may be due to a very low threshold level of about 5 mL when detecting stomach inflation with a stethoscope (9). When correlating peak airway pressure and stomach inflation assessed by ultrasound, an upper limit of 15 cmH2O peak airway pressure was favored (22), yet the study population was much younger and thinner than the usual cardiac arrest population. Stomach inflation did not correlate with an increased body mass index when no cushion support was employed in maximal head extension. Taken together, the data suggests that maximal head extension combined with no cushion support yields the lowest and thus safest peak airway pressure during bag-valve mask ventilation. This study had some limitations. First and foremost an interim analysis showed that a total of 800 patients would have been required to yield a statistical significance, regarding differences in peak airway pressure in the presence and absence of cushion support. The study did not include 800 patients because the work load would have been excessive to demonstrate a marginally clinically relevant difference of 4 cmH2O. Further limitations were as follows; i) this study was performed in young and overall healthy fasted patients in a fully-equipped operating theatre, ii) smoking status and therefore undiagnosed pulmonary disease was not investigated (obstructive airway disease was an exclusion criteria), iii) ventilation was analyzed without any further resuscitation efforts (i.e. chest compressions), iv) mask ventilation was performed by experienced anesthesiologists (ventilation may therefore vary when performed by minimally trained rescuers), v) fatigue while mask ventilating over several minutes in the three head angles may yield differing results, and vi) in cardiac arrest the upper airway and the lower esophageal sphincter muscle tone drop to ~ 0 cmH2O, and patients did not have any muscle tonus, which was emulated with induction of a complete neuromuscular blockade (TOF = 0%). Also, nurses, who assessed stomach inflation were not blinded to the head position. Finally, oral-pharyngeal or nasal-pharyngeal airway devices were not used to only investigate the influence of head position and allow comparison to prior studies. The data suggests that maximal head extension combined with no cushion support (i.e. positioning the head on a flat surface) yields the lowest and thus safest peak airway pressures during mask ventilation. The authors would like to thank the team of the day surgery unit at Innsbruck medical university hospital for their excellent support. Authors’ Contribution: Conceptualization, design, and conduction of the study were undertaken by Patrick Braun, Peter Paal and Anna Fiala; airway management and enrollment of patients were performed by Anna Fiala, Nicole Nachbar and Ruth Kroess; Nicole Nachbar recorded and prepared data for analysis, Anna Fiala, Sabrina Neururer and Peter Paal double-checked data; Sabrina Neururer, Nicole Nachbar, Anna Fiala and Peter Paal analyzed the data; Sabrina Neururer performed statistical analysis; Anna Fiala, Volker Wenzel and Peter Paal wrote the manuscript and all authors revised the manuscript; All authors read and approved the final manuscript. Funding/Support: No external funding is declared.